An optional title along the top. The data plot taking up most of the display area. The list of pens displayed along the bottom. An Temporary Trend, which is a time plot of a tag that you can request at any time. A Preconfigured Trend. This is a Trend Page Tag that stores the configuration of a trend. Right click on a Data Point Tag, which has historic storage enabled. Note: Trends are not supported on string tags. The X Axis time scale. The font face and size of text displayed in the trend. Which Data Point Tags are plotted. Which attributes are displayed with each pen. In the Tag Window, right-click on a folder and select Add New Tag, followed by Core, then Trend. This will create a new trend tag in the tag database. Press Return to accept the default name. Enter a name of your choice, then press Return. Double click on the trend tag. In either case the Trend Window will open. Choose the tag you want to display on the trend and drag it on to the trend window. Note: Only Data Point Tags with historic storage enabled can be added to a trend. Click the Save button to save the trend definition to the tag database. Double click on the trend tag in the Tag Window. 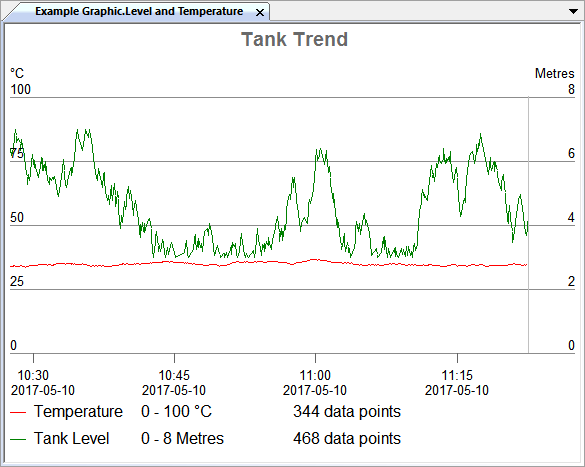 Click on the data plot area of the trend. Select the Data Point Tag you want to add in the Tag Window. Drag the tag onto the trend. Select the pen in the trend. Right click and select Show in Tag Window. The Data Point Tag will be selected in the Tag Window. Right click and select Remove. Drag the selected pen to its new position. The Scale of the Y Axis. Which Y Axis the pen is associated with (Left, Right or None). The status of the pen. Trend Properties - properties that apply to the entire trend. Pen Properties - properties that apply to each pen. To edit Trend Properties select the plot area of the trend. Title The text that appears at the top of the trend. TitleColor The color of the title. TitleFontFamily The font family of the title. TitleFontSize The size of the title text. XAxisInterval The time span of the X axis when the trend is opened. XAxisOffset The offset of the current time indicator from the right Y axis. XAxisTracking When set to True, the trend moves the X axis with current time. AxisFontFamily The font family used for text on the X and Y axes. AxisFontSize The size of the text used on the X and Y axes. PenFontFamily The font family used to display each pen at the bottom of the trend. PenFontSize The size of the text used to display each pen at the bottom of the trend. To edit Pen Properties select a pen at the bottom of the trend. Color The color of the pen. Label The label to display in the pen at the bottom of the trend. Source The Data Point Tag that provides the data for the pen. For information about storing trend definitions in the tag database. For information about tags that store data historically.